To receive further updates on this United Parcel Service (NYSE:UPS) trade as well as an alert when it’s time to take profits, sign up for a risk-free trial of Strategic Trader today. We are recommending a bullish position on United Parcel Service (NYSE:UPS). Labor and consumer spending are connected, and both have been maintaining positive trends over the last quarter. This should be good for consumption, even if business spending is flat. We think there are signs that traders are discounting UPS’s value because of last month’s lackluster earnings report from FedEx (NYSE:FDX). A similar scenario played out last quarter and led to a strong bullish move just prior to and after UPS’s earnings were reported in January. At first it may seem like the two companies are clones. It makes sense to make estimates about UPS based on FDX’s performance. In fact, UPS and FDX have a lot of overlaps, but each dominates in a different part of the delivery industry. FDX focuses on air services and overnight delivery targeted at business (where spending has been flat). UPS is more of a common carrier with a focus on small package delivery. The U.S. economy is largely driven by consumer spending, so UPS’s dominant position in package delivery means they grow with hiring, spending and wages. Although wages have also languished, hiring and consumer spending have continued to be very strong. Amazon (NASDAQ:AMZN)’s sales growth (assisted by UPS’s delivery expertise) has been incredible. We expect investors to start pricing those facts into UPS’s share price as we get closer to earnings later this month. UPS broke above resistance (completing a somewhat choppy inverse “head-and-shoulders” pattern) with the rest of the market on April 1. Since then, the stock has pulled back a little. 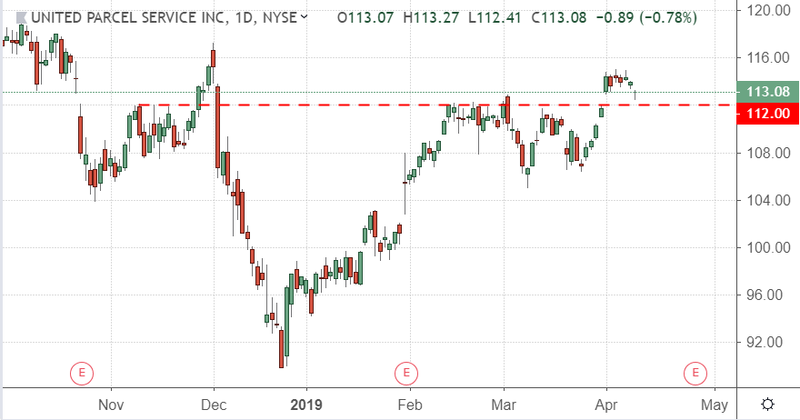 We expect old resistance at $112 to become new support, and we think it will hold as investors price in a surprise for earnings later this month. We recommend selling puts on UPS now that the stock has come back down a bit. If the stock stays above support, we could get to keep the full premium from this trade. To find out which UPS puts we’re selling — and to get access to our full portfolio of income-generating trades — consider signing up for risk-free trial subscription to Strategic Trader today. Article printed from InvestorPlace Media, https://investorplace.com/2019/04/using-ups-to-profit-from-job-growth-and-amzns-success/.